A recent graduate of the Grocery Manufacturers Association, Sean McBride, has established his own consultancy and blog. Through it, we here at ACSH learned of a potential solution to the nationwide simmering controversy: should food products containing GMO ingredients be labelled as such, by force of law? (Sean s post also alerted us to a column in today s New York Times by Andrew Revkin on this topic: A Smart(phone) Solution ¦. Mandatory labelling of biotech foods has been subject to referenda in several states recently (CA and WA come to mind), but after lengthy and expensive campaigns, these proposed bills were defeated. However, other states continue to contemplate such mandates, which if enacted would lead to a stultifying patchwork of food laws making life difficult for everyone: food industry companies, ag-chemical companies, and concerned consumers. The winners: those anti-chemical, pro-organic agri-businesses (and the NGOs whose missions are to spread fear and profit thereby and the media exploiting these stories). One response to these mindless right-to-know laws has been the true (but off-putting for many), Well, if someone really wants to know if a product does or does not contain GMOs, it s all available on the Internet. That s just too high a hurdle for many. But, what if one could just shine a light, literally, on a product and see immediately? Now (or soon), you may be able to! A proposal to urge (or even require) food manufacturers to include on their label a bar code to reveal, among other things, whether GMOs are present, has been endorsed by recent Secretary of Agriculture Dan Glickman, and the current USDA head, Tom Vilsack. Thus, any consumer truly concerned about GMOs can have this label at her or his fingertips while the overwhelming majority of shoppers who care not a whit about biotech food s alleged harms (all mythical we might add) can shop on their merry way, blithely indifferent to the presence or absence of such bioengineering. The obvious benefits of this approach are that it avoids the skull-and-crossbones equivalent of a GMO-Containing label. Meanwhile, those who want to utilize GMO-Free as a marketing tactic to cater to that segment of the population are free to do so, plus any food with the Organic label must be GMO-free by definition of the Organic Trade Association. ACSH s Dr. Gil ross had this perspective: While the anti-GMO advocates assert that they are in favor only of transparency and the consumer s right to know what s in their food, in fact the main generator of the anti-GM hysteria is the Big Organic lobby and the anti-pesticide, anti-business foundations and NGOs who fellow-travel with them. They will disdain and oppose this common sense conception, since it fails their main objective: to scare the public away from GMO-containing food via a big scary label and over to expensive, health-benefit-free organic products. Too bad for them if this technology takes off, as it should. 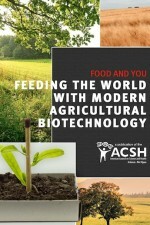 For the science on biotech-GMO foods, check out ACSH's publications.